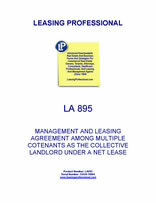 This property management agreement is to be used when a commercial property is owned by several tenants in common, as opposed to one legal entity. This often occurs when property is held by family members, or investment affiliates. 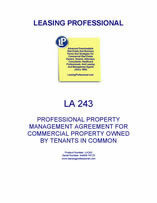 This property management agreement is for the engagement of a professional commercial property management firm for a large commercial property. The property is owned by several tenants in common collectively, who hold the property for investment and desire to provide for the long term management and leasing of the property by a professional firm.